Coming perhaps fifteen years too late to feature as the soundtrack to some ‘90s teen rom-dramedy, Best Coast’s Crazy For You is nevertheless a timely reminder of a time when pop was pop. Simple, fun-loving, slightly heartsore yet ever hopeful. Almost surprisingly for such a stereotypically Californian-sounding band (see following paragraph), this band actually comes from California. 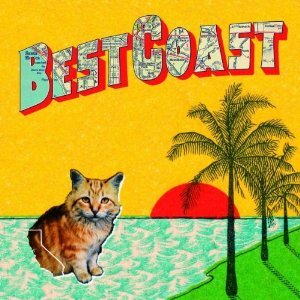 Consisting of vocalist/lyricist Bethany Consentino and Bobb Bruno (both former members of Pocahaunted), Best Coast released their first EP in 2009, followed by Crazy For You, their first full-length album. In fitting with the unpretentious surf/lo-fi pop genre, the album’s title announces exactly what it is going to provide. Crazy For You can most succinctly be summed up in three words: girl wants boy. It has the kind of youthful sentimentality, echoed down the ages from such songs as The Beach Boys’ ‘God Only Knows’, that is expressed through rhymes made with the same word (eg. rhyming “you” with “you”), and is peppered with refrains like: “I wish he was my boyfriend/I’d love him ‘til the very end” (‘Boyfriend’); and “Every time you leave this house, everything falls apart” (‘Goodbye’). With only one song breaking the three minute mark, the songs are all short, and therefore sharp and shiny. If they were dragged out any longer – as seems to be the case with so much of today’s pop –the songs would be ruined by their repetitiveness – again, something that ruins the pop of today. So, despite the fact that the songs are all much the same, which is perhaps the strongest argument against this album, they never outstay their welcome. However, before you go making any assumptions that I’m sure you’ve started to, there’s more. While on the surface, they may sound like the love child of Mama Cass and her surfing instructor, Best Coast have brought something of their own to the mix. With lyrics that refer to cheating, stealing, estrangement, mental disarray, and “a bunch of weed”, there is something of the modern existential dilemma here. It’s not so much shy-girl-longs-for-sweet-boy-from-afar, as moody-girl-bewails-failed-relationship-with-insensitive-boy. The band will be coming Down Under to share some California dreamin’ early next year for the Big Day Out. And to all of you out there in Adelaide and Perth, not to worry, Best Coast were not affected by the unfortunate line-up cuts. They will also be doing sideshows in Sydney and Melbourne. Before you go to see them though, I would advise you to get the album, listen to it a bunch of times, then a bunch of times more, so you know all the words. That way you can sing heartily along, like you’re in the backseat on some magnificent, dramatic summer roadtrip. I LOVE this album! Only I find I always have to justify their place on my ipod because it seems so out of place with my views on relationships. It’s definitely a guilty pleasure. This entry was posted in Music and tagged Best Coast, Bethany Consentino, big day out 2012, Bobb Bruno, crazy for you, music, Review. Bookmark the permalink.